Hi guys!!!! Can we say long time no post?!? I’m sorry I’ve been MIA for a while over here but I swear I have a good excuse: we are expecting baby number two in November and I’ve been on the couch barfing for the last 3 months! 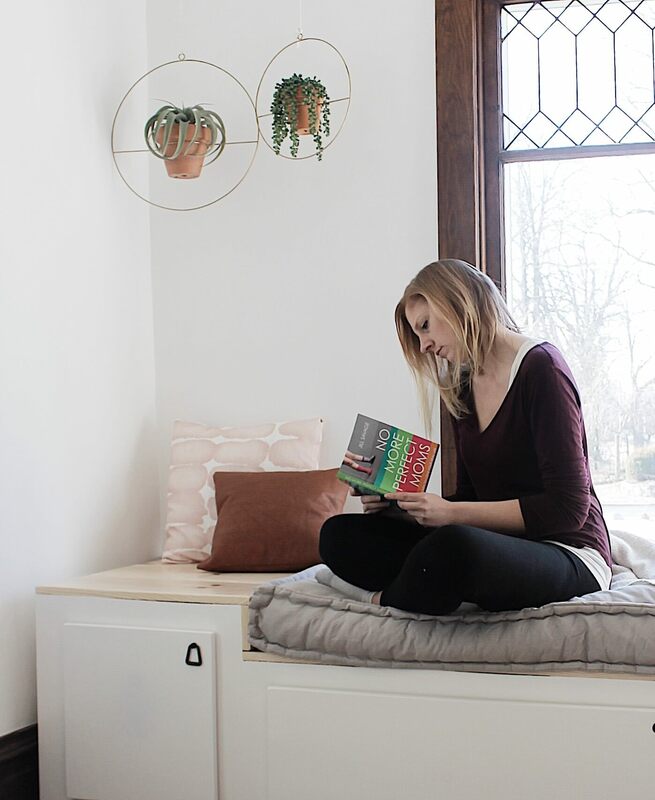 But I won’t keep you waiting for the reveal of our DIY modern window seat for another minute!! For being complete amateurs attempting something like this, I think it turned out perfectly, don’t you? This was after weeks of ripping down a drop ceiling, putting in a whole new one, scraping old wallpaper, and restoring and painting the original plaster walls. You can follow the journey here if you missed it! Basically, we measured the space and my husband built a shell to fit the area out in our garage. Then he covered the sides with plywood and we painted away! 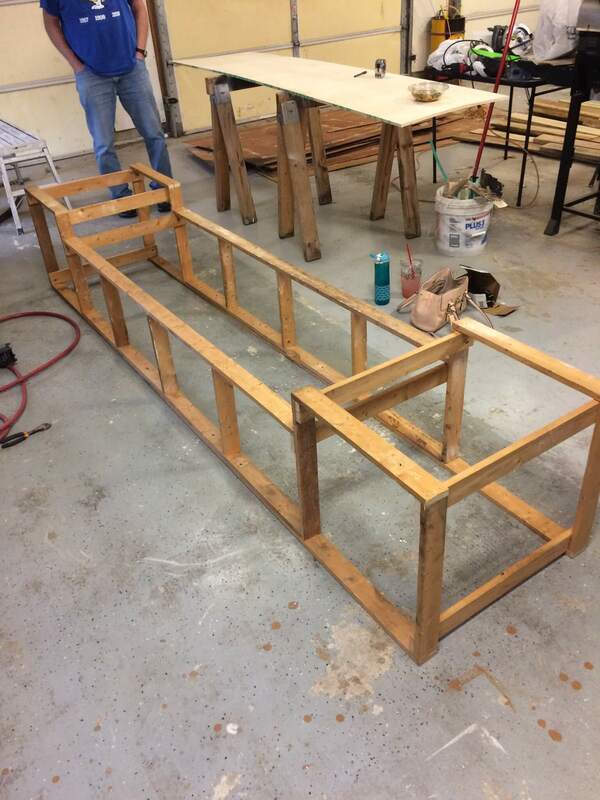 This bench turned our whole entryway from a pass-through room, to a room where we spend a lot of time. Do you see all that storage underneath? Full. Of. Toys. My daughter plays for hours here and this big comfy rug is my favorite rug in the whole house. Its so nice to have the extra storage space for toys, especially because sometimes you just need a place to stash stuff! I’d be lying if I said my husband and I didn’t fight over who gets to take naps on the cushion! It is from Urban Outfitters and once I found this baby, we built the bench around it. Its that good. You can find it here. 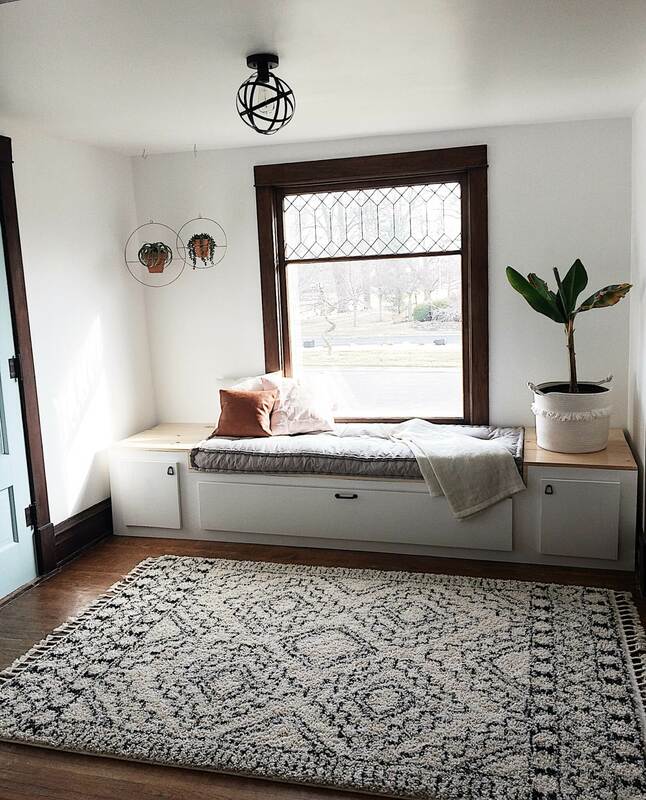 I wanted this bench to have clean, modern lines, but still fit in with our old house and trim. 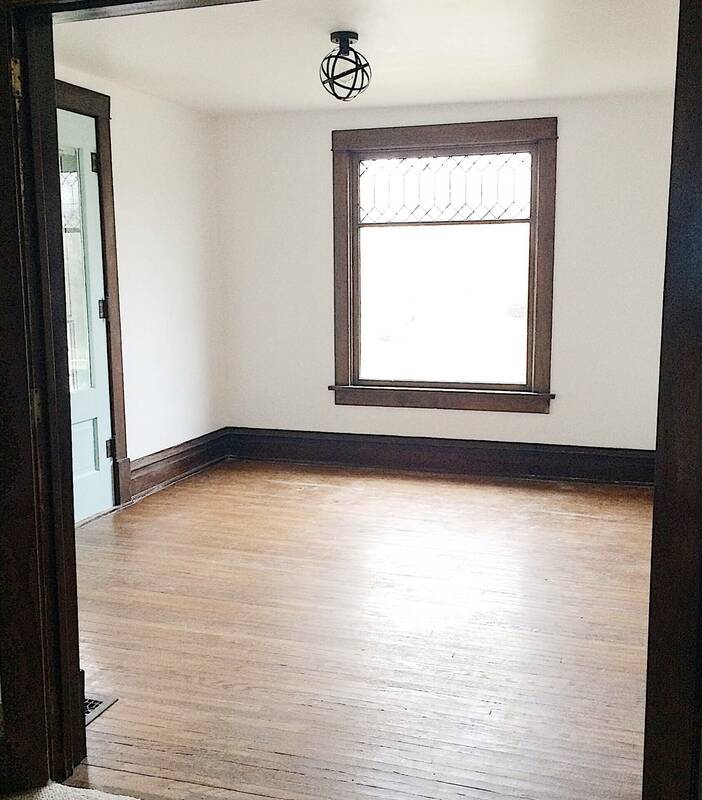 Oh, and it needed to really highlight that amazing leaded glass picture window, since it’s basically the reason we bought the house 😉 Also, between the dark wood trim and the hardwood floors, I really wanted to lighten it up with a lighter stain. How fun are those little pulls? I found them on clearance at Menard’s, so I don’t think they are available any more, but here are some similar ones. And what post would be complete without an action shot? 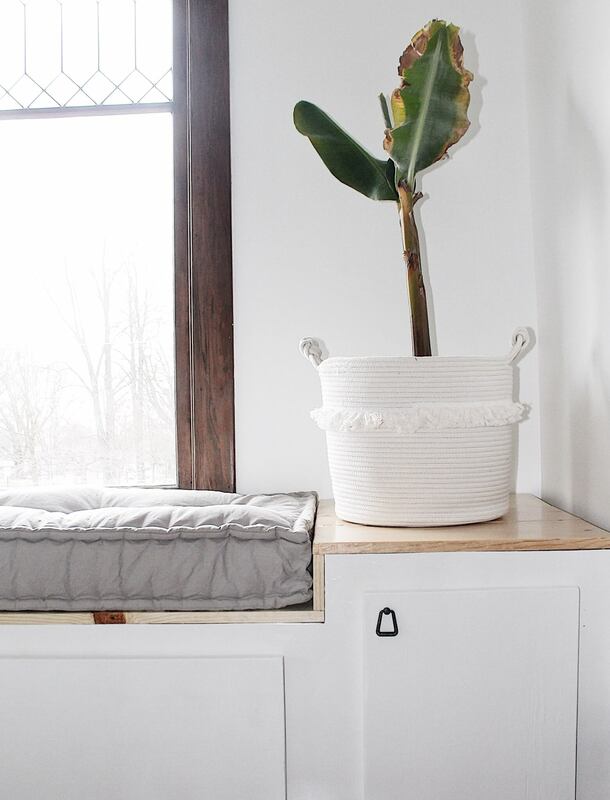 Those planters are my absolute favorite thing in the world but they are discontinued from Magnolia Market. Sad face! I’ll keep an eye out for similar ones and let you guys know if I find any!! 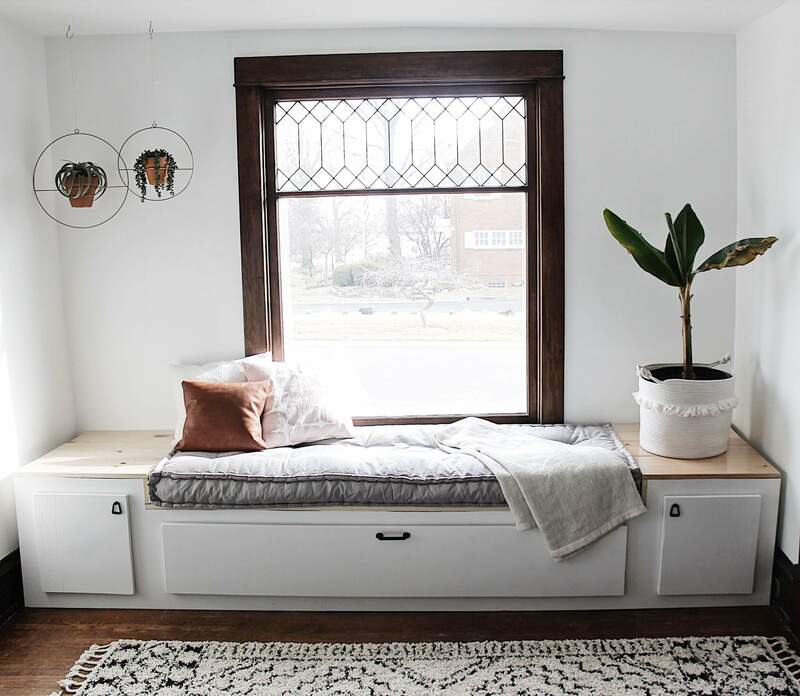 So what do you think of our new DIY modern window seat?! It took a while but was totally worth the wait! To keep up on our most recent projects, be sure to follow The Definery Co on Instagram!